The grasp of our Ego often takes us by surprise, and can hook us into a state of utter and complete turmoil. Why does our mind like to torture us so? What is it we have done so wrong, to deserve such treatment by our very own thoughts. When the Ego casts it’s spell, it throws us into a dark and gloomy hole. A cave of despair and negative thinking, with gapping hollow chambers that seem to close in further with each breath we take. When the Ego disguises itself, it can easily ambush us into a thought pattern of deception and distortion, with seemingly no way out. The truth is, the Ego is an identity of our own interpretation, an identity which is completely false. Why is the Ego so hard to explain or describe? The Ego is difficult to define because the Ego isn’t one specific thing. It is actually made up of many different beliefs that we acquire over our life. The Ego begins it’s programming the moment we are born. It is difficult to see and understand, because of it’s cunning way’s. 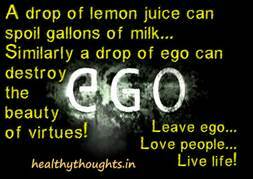 The Ego is righteous and will generate powerful emotional reactions to situations. Our Ego is arrogant and insecure, a force to content with that is for sure. We have spent years, often many decades building our Ego self-image, living inside of our negative thought patterns and stories, all the while reinforcing them over and over again. Removing our false beliefs and better understanding our true self takes time and patience, but it something that can be achieved. Things that are worth doing take stamina, persistence and diligence, but think of it this way, that which is causing you unhappiness is more than worth the effort. Begin to question your own self thinking, the thoughts that swirl around your head – are they really telling you the truth? Are your core beliefs about yourself and the world the mastery of your Ego? Check in with your gut feelings and see if you notice the difference.